Not everything is written in stone, my old boss used to say. And he was right. New compositions get subjected to the buffeting of the proverbial winds. Audiences, the opinion of contemporaries, critical notice, all can effect the fate of a work, especially in the beginning. 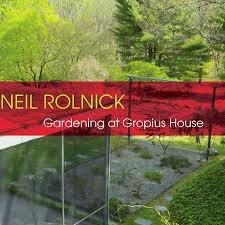 And so invariably it is with Neil Gropius and his two recent works on the album Gardening at Gropius House (Innova 877). I try to pay no attention to reviews or other critical information before I write a review myself. It's better to approach the work with open ears and see how it effects you. So as usual I've done that. Of the two works I like the first a bit better than the second. The first is in fact the title work, "Gardening at Gropius House" (2012), performed by members of Alarm Will Sound, Todd Reynolds taking the solo violin part, Alan Pierson conducting, the composer on laptop computer. It is shifting meter music, with a definite pleasing motility, syncopation and the solo violin part almost concerted-folkish in its use of double stops. Todd does a great job, the music stimulates in its ever changing, ever the same kind of forward motion. Perhaps it does sound something like it feels to garden for a famous architect, in the yard of his house. There is a bit of dissonance in the chamber-orchestral part, which perhaps represents Gropius and his modernism? At any rate it all works well. The second work has on the surface a similar momentum, but this time there are vocal parts in a mini-cantata/opera, which the composer calls a "monodrama", "Anosmia" (2011). It is about a man who loses the use of his nose and pleads with his would-be partner to help him, to "be his nose". It's scored for three singers, the male baritone part sung by Daniel Cilli, the soprano and alto parts by Maya Kherani and Carrie Zhang, respectively. The San Francisco Conservatory of Music's New Music Ensemble takes on the instrumental parts under the direction of Nicole Paiement. Maestro Rolnick adds a a part on the laptop as before. All sound well. The music is intended to be a farce and there is a kind of semi-banality in the vocal parts which is belied by a fairly sophisticated chamber-orchestral score. It sometimes reminds me of a very convoluted remake of the Tom Jones pop hit "What's New Pussycat?" if you remember that. Indeed there is a kind of tongue-in-cheek pop art aspect to it. I find it less interesting than the first work. It has the playfulness of Stravinsky's "Renard the Fox" but perhaps not the inventiveness. Stravinsky is no act anybody would want to follow, though, so we should not be too severe about it. Not when it pokes fun at itself. Rolnick gives us an alternative vision of modernity or post-modernity. There is mostly tonality going on, some minimalist repetition, a kind of deliberate banality in the second work, a more sublime disregard of such things in the first. What I say is not written in stone, remember? It is merely my opinion. The "Gardening" piece with its Todd Reynolds violin performance is worth the price of admission. Your comments are of course taken well. Poetic spam. Glad you have a gardening business. All is like a garden. Composes give birth to music as a field produces natural goodness. I write reviews as a gardener tends the plants of others. I water them as well as I can but I cannot take credit for their existence. I only help them to strive skywards. Give them space to be.